Five alleged associates of the New York-based Genovese crime family have been arrested on extortion-related charges in Massachusetts. The men, the "Springfield Crew," are accused of committing crimes in Springfield, Massachusetts, including loansharking and extortion from both legitimate and illegal businesses. Federal prosecutors say the men used violence, exploited their affiliation with La Cosa Nostra and made implied threats of murder to instill fear in their victims. 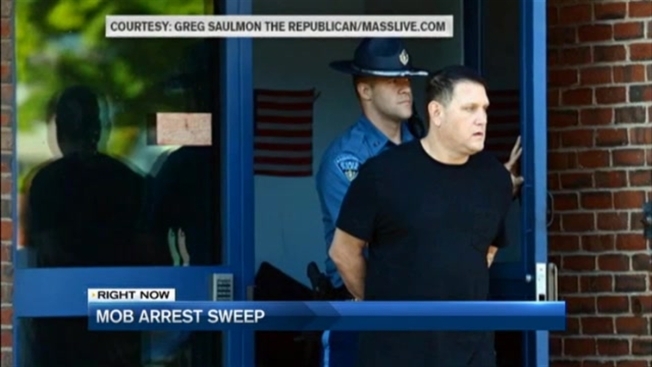 The men arrested in an early morning sweep Thursday include: Ralph Santaniello, 49, Giovanni Calabrese, 53, and Gerald Daniele, 51, all of Longmeadow, Massachusetts. Also arrested were Francesco Depergola, 60, of Springfield, and Richard Valentini, 51, of East Longmeadow. According to the indictment, the defendants were associates of the Genovese La Cosa Nostra crime family in New York and committed various criminal activities in Springfield, including loansharking and extortion from legitimate and illegitimate businesses, including illegal gambling businesses. They allegedly used violence, exploited their relationship with La Cosa Nostra and implied threats of murder and physical violence to instill fear in their victims. In 2013, Santaniello, Calabrese, Depergola and Valentini allegedly attempted to extort money from the owner of a Springfield towing operation. Santaniello and Calabrese allegedly assaulted the businessman and threatened to cut off his head and bury his body in the backyard if he did not comply. The businessman wound up paying $20,000 over a four-month period to Santaniello, Calabrese, Depergola and Valentini to protect himself and his business. In addition, during a six-month period in 2015, Daniele allegedly extended two loans to an individual and then - along with Santaniello and Calabrese - threatened the individual if he did not make payments on the loans. It could not immediately be determined if the men have retained lawyers. The Massachusetts arrests were part of a massive mob sweep that included the indictment of 46 suspects by federal prosecutors in New York. The indictment accused the defendants of extortion, loansharking, drug dealing, mney laundering, casino-style gambling, sports gambling, credit card fraud and health care fraud. It said they formed a syndicate operating in New York, Massachusetts, Pennsylvania and Florida.